I've posted my photos from the MythBusters Encinal High Benefit event last night. jutta and bayareajenn have also posted photos on Flickr -- you can probably tell from all of our photos that the lighting inside the auditorium was fairly challenging. 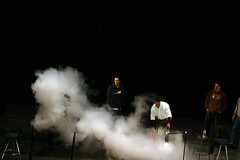 Most of my photos are from a live demonstration of the Cooling a Six Pack Myth. They also did about an hour and half of Q&A and showed a hilarious ten-minute blooper reel. Some clips they blooper clips were familiar (Tory face-planting after jumping a wagon with a bike, Adam wearing Jamie's shirt), but many new as well. Wow! Thanks for sharing those photos with the rest of us :-) That looks awesome -- I am sure you must have enjoyed yourself which is cool! about the myth and beer. it was done wrong on the episode. to do this you need to dig a hole near a water sorce so the hole fills up add the beer. cover with sand. the sand will soak up the water. then pour on the gasoline. light and burn it off. uncover the beer and it will be chilled.